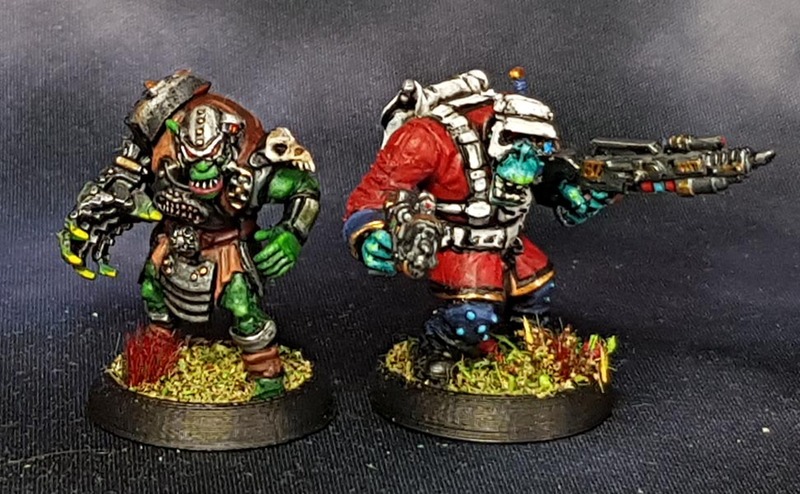 The time has come for the Warpath Orx Marauder Command figures, and the Kings of War Goblin Spitters. There were two sprues of the old Marauder Orx Command, each with parts to make two miniatures plus extras for the bits box. However the scale, the Orx were still brutes that seemingly were equipped from the scrap-heap, just like Space Orks. They were also sci-fi versions of their fantasy Orx and made in hard plastic by Renedra, as most of the other early (pre-kickstarter) Mantic minis were. And as such they are actually really nice minis with good details. The bases are 25mm. In recent years, Mantic has been edging more towards the heroic propotions, especially with the Orx. This is pretty obvious when compared to the more recent DeadZone commandos. These are supposed to be from the same army…the commandos seem to have developed pandemic hydrocephalism together with much longer arms. And incindentially, look much more like Space Orks than the older Orx do. These are some of the infamous Kings of War hard plastic goblins made in China after the first Kings of War Kickstarter. Presumably, Mantic turned to an unproven Chinese factory for manufacture instead of the proven UK-based Renedra both to save a significant amount on the tooling and manufacture costs, but rumor also has it that Renedra might not actually have had any open slots to make anything for Mantic at that time anyway. Together with the even more infamous Basilean Men at Arms, the hard plastic goblins were apparently a product of bad communication, misunderstandings and lack of quality control before signing off on production. The hearsay goes that the Chinese manufacturer was not able to use the 3D-files correctly, and traced them into their systems manually or similar. This causing a significant worsening of details and all that. Insistent rumors also tell that the manufacturer had said things like that they had extensive knowledge and experience with making such miniatures, without that being true. They seem to have botched the job because they did not have the necessary skills. At any rate, Mantic must have signed off on production without looking too hard at the results (probably a mix of naivete and time pressure to deliver the KS), and I can just imagine the expressions on the faces of Mantic when they got the shipment with the sprues in. That is a sunk cost, if I ever saw one. They would not have been able to afford not to release neither the Basileans nor the Goblins, even thought they must have known the flak they would get for them. In truth they are simply horrible miniatures. Soft details, badly fitting parts, mould lines like you wouldn’t believe. It’s like they were parts for some cheapo boardgame in the 80s. Yes, that bad. And the Goblins were better than the Basileans, I can tell you that. I am very glad that there were no more of these Goblins or even any Basileans in the Bobbybox. Also, it seems that Mantic have learned their lesson with all the newer hard plastics being significantly better in every way. A hard learning curve, that Flying Frog of Shadows of Brimstone fame also have had to climb. Just 31 left to do!